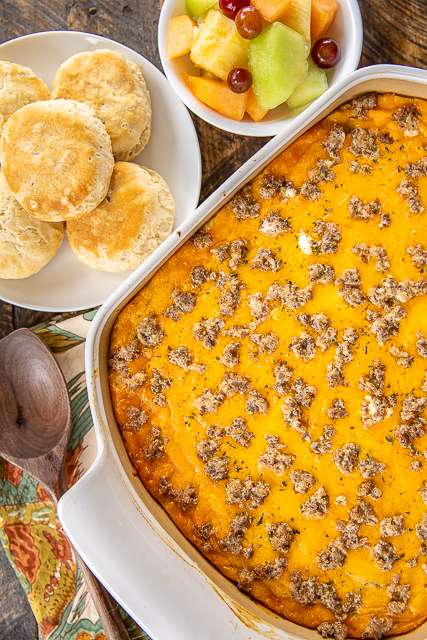 This Sausage & Cream Cheese Grits Casserole is everything I love about breakfast. Sausage, cream cheese, cheddar cheese and grits. Happiness in every single bite! 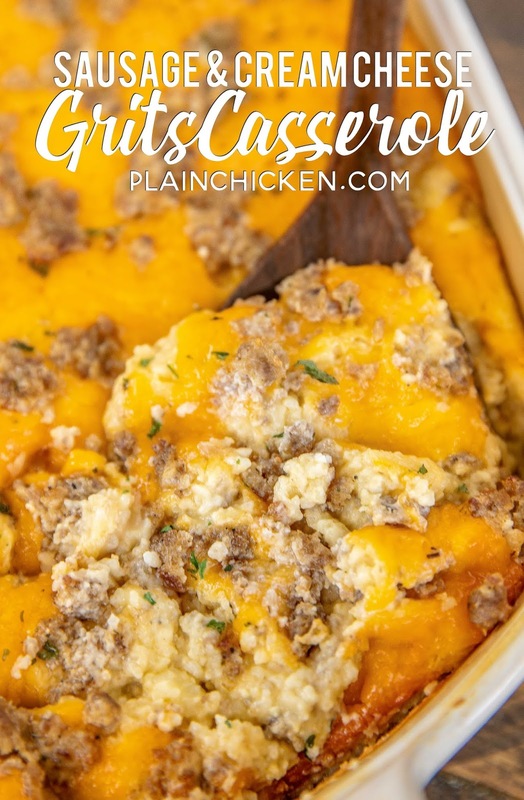 The best thing about this casserole is that you can make it ahead of time and freeze it unbaked for an easy meal later!! 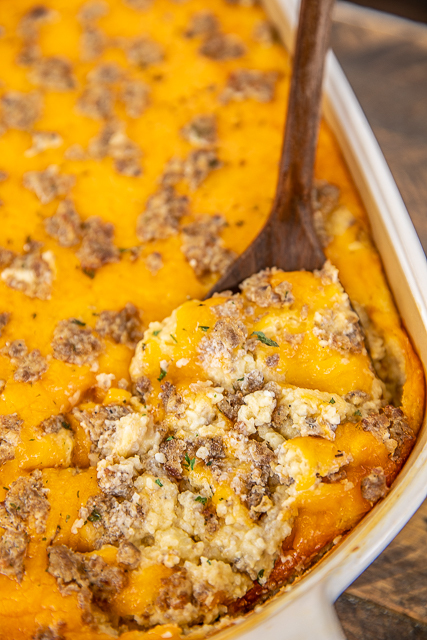 We love eat this Sausage & Cream Cheese Grits Casserole for breakfast, brunch, lunch & dinner. It is delicious anytime of day. All you need is a side of fruit and some biscuits and you are set! This makes a lot of food. If you don't need to feed a crowd, you can half the recipe or split it between two pans. Bake one pan now and freeze one for later. Love a recipe that can do double-duty! I always get a lot of questions about sausage when I include it in recipes. I use Jimmy Dean or Tennessee Pride sausage. It is next to the bacon. I like to save a little of the sausage and cream cheese mixture to sprinkle on top of the casserole. This is totally optional. I just think it makes a nice presentation. I also sprinkle it with a little dried parsley for color. We have this on the menu for Thanksgiving day for breakfast. It would also be great for Christmas morning or overnight guests. I promise it will be a hit! In a large skillet, cook pork sausage over medium heat until no longer pink. Drain fat. 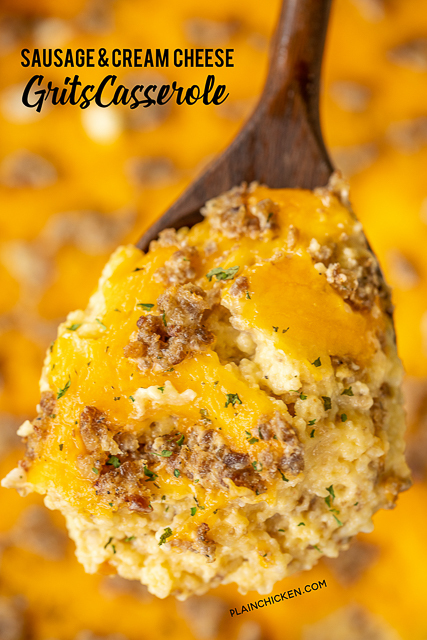 Stir in cream cheese and break into crumbles. Set aside. Add Velveeta cheese and butter; stir until melted. Stir in milk. Slowly stir in eggs until blended. Stir in 3/4 of sausage mixture. Transfer grits to prepared dish. Sprinkle with shredded cheese and remaining sausage crumbles. Awesome recipe - what if I want to use stone ground grits? Would it change the cooking process/time? I am sure that it would. Stone ground grits take much longer to cook. You will need to experiment with the cooking times. What about using regular grits and not the quick cook ones? How well do you think it would work and how much longer do you think it would take to cook? I think it would be fine with stone ground grits. You will need to follow the directions on the package you use for the cook time. Could you assemble this the night before, store unbaked in the fridge, and then bake the next morning? I need to serve a crowd - are there any changes for doubling this recipe?